Also Recommended: Fans here at THEM can probably think of others, but the one that immediately struck me was MOONPHASE, another anime with strong characters, creepy atmosphere, occasional comic touches, and a weird musical number. Notes: Based on the manga by Yasunori Mitsunaga, currently running in Kodansha's Monthly Shonen Sirius. Hiro Hiyorimi is a teenager who has come to live with his older sister in a creepy mansion. While in town, he rescues a beautiful woman from falling iron beams but is himself crushed by them. The woman, who happens to be the mistress of the mansion, is Hime, a princess of the Monster Kingdom, who resurrects him and gives him "half-immortality" (he can't be killed, but he can die if he goes past the time limit of the Flame of Life Hime has given him.) Bound to Hime by the requirement that she recharge his Flame from time to time, Hiro is definitely in over his head, having to protect Hime from monsters sent by her murderous siblings. Think The Addams Family re-imagined as an action series, and you've got a pretty good idea how this one goes. 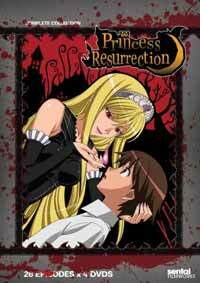 The quirks of the characters in the Addams Family were the primary interest of the series, and much the same can be said of Princess Resurrection. Hime herself is dignified but cold, and can be cunning and cruel, but she can also show kindness and gratitude to the 14-year-old boy who becomes the first of her new group of retainers (she had many before, but they were all killed in a battle with one of her brothers.) Hime also acquires the services of Liza, a half-werewolf who originally wanted to kill Hime; Reiri, a vampire who originally feigned indifference to Hime's plight but finally formally allied with her; and Hime's kid sister Sherwood, who's quite a bit more light-hearted and playful than her onee-san (though also often annoying, as kid sisters in anime often are.) I classified this as a "harem" comedy with a question mark because while Hiro is surrounded by females (and in one episode Liza, Reiri, Sherwood AND Hime all tease him with suggestive remarks), the females in harem shows are not normally all so...well, creepy. Stories range from pure fluff to some pretty serious stuff. My favorite in the latter category is one where Hime captures some werewolf assassins and locks them in the cellar. They are also "half-immortals" (like Hiro), and keep self-resurrecting when killed, so Hime keeps shooting them (with silver bullets, of course) until their Flame of Life is exhausted. It's a startling scene: the shots going keep going on, over and over, while poor Hiro sits outside the door in anguish, knowing that he's now basically the same kind of thing they are (a point hammered home even more by Hime's last lines in the episode). Another one is classic horror: Hime and Hiro are stranded in a village where supernatural events are causing a re-enactment of the mass murder of the village inhabitants by a sickle-wielding maniac. It's not as original as the previously mentioned episode, but it's strong on atmosphere. The music, like everything else in the show, is pretty off the wall, particularly the closing theme, which is similar to the opener of Rozen Maiden but with even kinkier lyrics (it's titled "Bow Down and Lick My Feet".) This release doesn't have a dub track, which is fine; but for some reason, some of the words in the subtitles are missing letters. Recommended Audience: Usually the audience for an anime somewhat resembles the leading character, so yes, probably 14 year old boys (and up). The creepy atmosphere and occasional outright scares should preclude the younger set. There is also an episode where Liza is nearly bare-breasted.